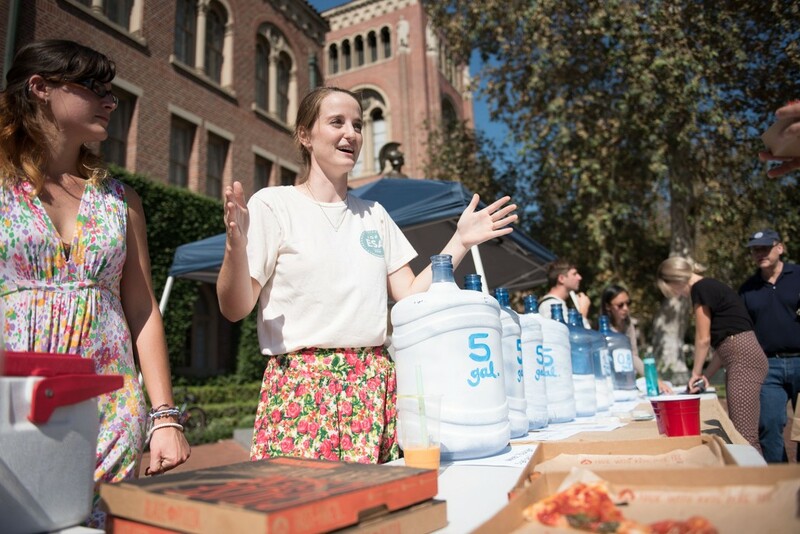 The Environmental Student Assembly hosted an event, “Water You Doing About the Drought,” Tuesday that encouraged students and faculty to decrease their water consumption and contribute to drought mitigation efforts. 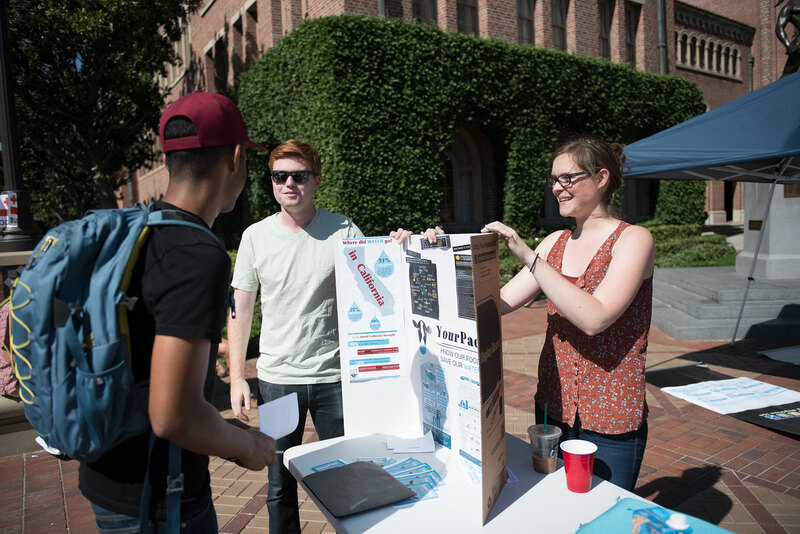 Between noon and 2 p.m. in front of Tommy Trojan, ESA members displayed informational posters and several five-gallon jugs of water to illustrate the average amount of water used in performing different activities and making everyday products. Turning on air conditioners, for example, consumes five gallons of water every eight minutes; 500 gallons are required to produce a single hamburger patty. The event drew a large crowd of supporters, many of whom signed pledges promising to reduce their personal “water footprints,” their total direct and indirect consumption. Some easy suggestions for curtailing water usage include taking shorter showers, only washing full loads of laundry and turning off faucets whenever possible. Joy Ofodu, a sophomore majoring in communication who attended the event, said that she will use the shower timer that was given to her by USC Housing more often. “It’s really helpful. You realize you don’t need any more time than [the timer] gives you,” Ofodu said. Other suggestions included dietary changes. “The best way [to limit water use] is to eat vegetarian,” said Avery McEvoy, director of advocacy for ESA. McEvoy said this is because there are many indirect factors that go into livestock production, such as the water required to make the food they eat. McEvoy acknowledged, however, that consuming meat is a difficult habit for many to break. The ESA is part of the Undergraduate Student Government’s Program Board, and was established in 2014 to advocate sustainability goals. 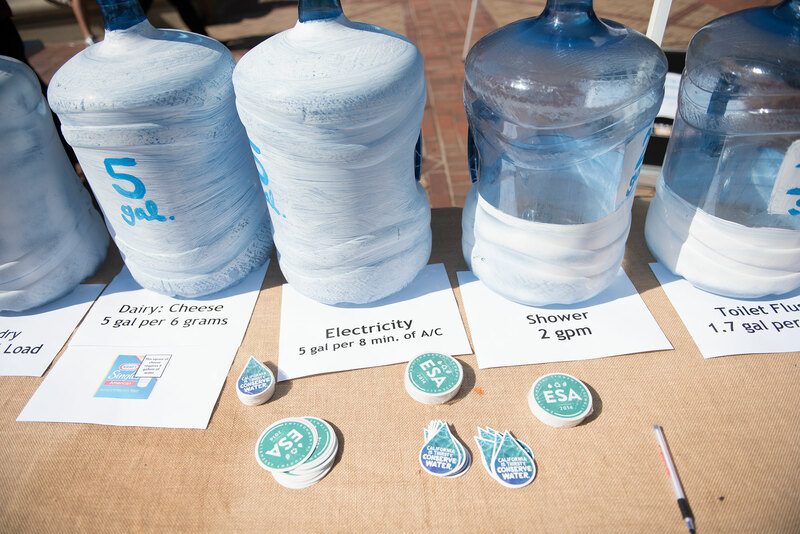 Some of ESA’s events include the popular farmer’s market held on campus every Wednesday and its signature “Earth Month” awareness campaign in April. The organization meets weekly on Tuesdays in the Ronald Tutor Campus Center. Many Californians are well-aware of the drought’s severity and of the need for residents to sharply reduce their water footprints and have already experienced government-mandated restrictions on water use. 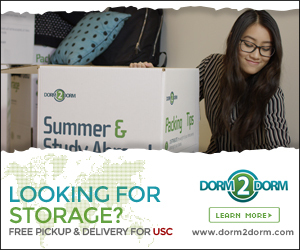 USC itself must take steps to decrease its consumption by 16 percent per Los Angeles regulations. 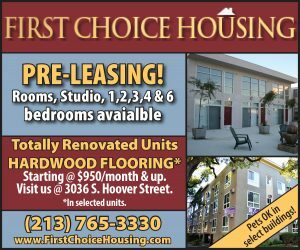 USC Housing has already worked toward reaching this goal, installing low-flow showerheads and toilets, as well as more efficient washing machines in residence halls. Yet in order for these conservation efforts to succeed, students must ultimately bear the responsibility of cutting back on their water usage.